After a night out drinking, it is often hard to determine if you have reached or even exceeded the legal alcohol limit. This is shown by a federal government study that found nearly one-third of all annual traffic deaths in the U.S. involve alcohol-impaired driving. This breaks down to nearly 10,000 preventable deaths each year. A personal breathalyzer is a simple way to prevent this from happening and take the guesswork out of deciding if it is safe to drive. 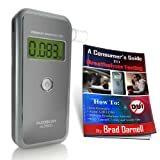 BACtrack's breathalyzers make monitoring blood alcohol content easy. What is a BACtrack Breathalyzer? How Does a Traditional Breathalyzer Work? How does the S80 Pro Work? BACtrack's mission is to help people monitor their blood alcohol content (BAC) and make informed decisions. They do so by providing users with the industry's most accurate, innovative and affordable blood alcohol testing devices. With a wide range of products, BACtrack makes it easy for everyone to stay safe. While they make a wide range of products, including those that synch to a smartphone or are small enough to fit on a key chain, the one we will focus on in this post will be the BACtrack S80 Professional. This is by far the best-selling device and is one that other devices on the market try to compete with. The S80 Pro model is a police-grade device and is accurate enough to be used in both professional and personal capacities. 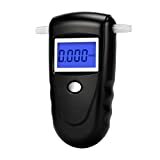 A breathalyzer is an easy way to determine if someone has had too much alcohol; officially speaking, it will let the user know if they are over the legal limit which is .08 percent. After a drink (or many), the alcohol is absorbed into the bloodstream. The blood then carries these alcohol molecules throughout the body where they eventually reach the lungs. They are then expelled as the person breathes. This is why someone who has been drinking smells like they have been drinking, alcohol causes the breath to have a very distinct odor. The concentration of alcohol in the lungs closely matches the concentration of alcohol in the blood. This is why a blood test is not needed in order to get a blood alcohol reading. To test blood alcohol content, the user must wait 15 minutes after they have eaten, drunk or smoked in order to get the most accurate reading possible. This is the shortest amount of time needed to perform a reading of any of the breathalyzers we reviewed. 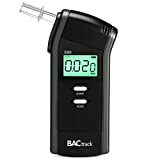 When the user is ready to test their BAC, they will need to turn on the S80 device with a simple push of a button and wait for the countdown timer to reach zero. Then, take a deep breath and breathe into the mouthpiece until the beeping stops. The BACtrack S80 is considered one of the most accurate devices on the market and that is due to the optimal breath capture within the device. In order to ensure only a precise breath sample enters the alcohol sensor, ambient air, fumes and other airborne gases and particles are filtered out. This ensures that the sample the device is reading is not contaminated. Once the breath sample has been analyzed, the blood alcohol content is displayed on an easy-to-read LCD screen. The whole testing process takes only seconds. Police-grade Xtend(R) Fuel Cell Sensor Technology. This is the same technology that is trusted by those who require accuracy and consistency. Effective Breath Capture. This mini-solenoid internal breath pump ensures only what needs to be tested is tested by filtering out ambient air, fumes and other gases. One-button operation. The device is started with a simple push of the power button. Within seconds, the device is on and ready to use. LCD Screen. The results are displayed on a bright and easy-to-read screen. DOT/NHTSA Tested and Complaint. This model meets all federal requirements put in place for breath alcohol screening devices. Extra Mouthpieces. Six extra mouthpieces are included with the purchase to keep the device sanitary. Additional mouthpieces may be purchased from a supply store or online. Long battery life. The device is able to perform 1,500 breathalyzer test on a single pair of AA batteries. Warranty. All devices sold by BACtrack come with a one-year warranty. Guarantee. A 30-day, money back guarantee is included to make sure everyone who purchases a device is completely happy with it. Free shipping. Orders within the United States ship for free. The S80 Pro retails for $$$. It can often be found on sale online. The single button design makes the device easy to use.The single button design makes the device easy to use. The battery life is the longest of the devices we tested. The Effective Breath Capture filters out imperfections in the test sample to ensure the best results possible. The device has been tested time and again and has been found to be incredibly accurate. The device is more expensive than many of its competitors. The single button design makes the device easy to use. The price is well below its competitors. This device is not as accurate as others. 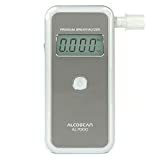 The AlcoMate Premium AL7000 Professional Breathalyzer contains patented PRISM Technology, which addresses the major flaws of other breathalyzers on the market - the calibration. The PRISM Technology eliminates the need for additional calibrations, which ensures the device stays accurate long term. Traditional breathalyzers lose their accuracy over time. Within a year, most models require manual calibration. Unfortunately, manual calibration is inherently flawed and is often time-consuming, as most devices must be mailed back to the manufacturer to have this done. The reason machines need to be calibrated is because of residue buildup and functional degradation inside the sensory cavity. Calibrating the machine without addressing these issues simply teaches the machine how to show more accurate results with the degraded sensor. After many years and many calibrations, the sensor may reach a point where it has degraded beyond repair. When this happens, the machine can no longer be calibrated and is, therefore, no longer accurate. PRISM Technology eliminates this problem. Now, users are able to replace the sensor module themselves, thus removing the need to ever calibrate the device. This process is quick and easy. After the sensor is replaced, the AL7000 is back to the condition it was on day one. The AL7000 is approved for law enforcement use by the US Department of Transportation (DOT) and is popular among both professionals and civilians. In fact, the AlcoMate brand was selected by the US Navy and their single-supply source for their alcohol testing needs. The process of using the AL7000 is simple. Like most models, the user must wait at least 20 minutes after eating, drinking or smoking before using the breathalyzer. They will then put the mouthpiece in their mouth and press the power button; this begins the breathalyzer's warm-up countdown. When the countdown is over, the word "blow" will appear on the screen. The user will then blow steadily into the mouthpiece until the long beep ends; this takes roughly four to five seconds. The breathalyzer will then analyze the sample and displays the calculated BAC percent on the screen. The device turns off on its own after 10 seconds. The PRISM Technology creates an accurate reading every time and reduces the need for calibration every year. This device is the most expensive of the bunch. The device is slow to load. 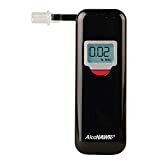 The AlcoHAWK Elite Slim Digital Breathalyzer boasts a slim design that is built on quality and performance. The device has a professional feel and a sleek and modern appearance. The AlcoHAWK breathalyzer has the same single button design that the other breathalyzers we reviewed have. This makes it easy to operate. The Sensor Recognition Technology is able to monitor for certain types of abnormal sensor conditions. The LCD display is bright and easy to read. Foldable mouthpiece makes the device easy to carry. The battery life is subpar. The four breathalyzers on this list all had single power buttons and compact designs. Where the devices differed was their accuracy, their battery usage, and their price. While the PRISM Technology in the AlcoMate Premium AL7000 Professional Breathalyzer is impressive, the price point puts it out of reach for the average consumer. The AlcoHAWK Elite Slim Digital Breathalyzer was priced somewhere in the middle of the pack. It has a slim design, a single button in which to turn the device on and off and a well-lit and LCD screen. It performed no better and no worse than the others. And that is just it - the AlcoHAWK was average. For those looking to buy a breathalyzer that will last, this is not the one for them. The cheapest model we looked at was the Aoxin Professional Digital Breathalyzer. The device is fine for occasional usage, as the three AAA batteries only last for 200 tests. While this is the least expensive, the subpar results and the lack of battery life may nullify the price savings in the long term. The model we recommend is the BACtrack S80 Professional. This device is hands down the top performer on the market. While the price is high, the battery life makes up for it. The device can perform 1,500 breathalyzer tests on a single pair of AA batteries. This BACtrack S80 Professional is worth the investment.